My oh my, does time fly by! 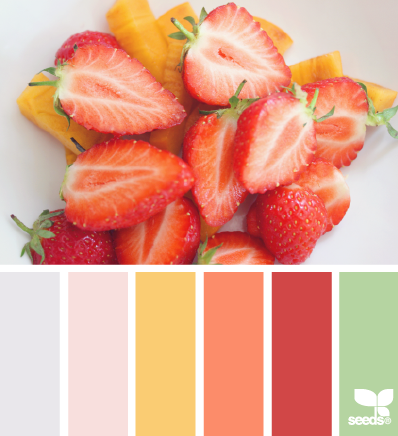 It’s the start of a brand new shiny term at House of Cards and this month our challenge is Food and/or Color Inspiration. 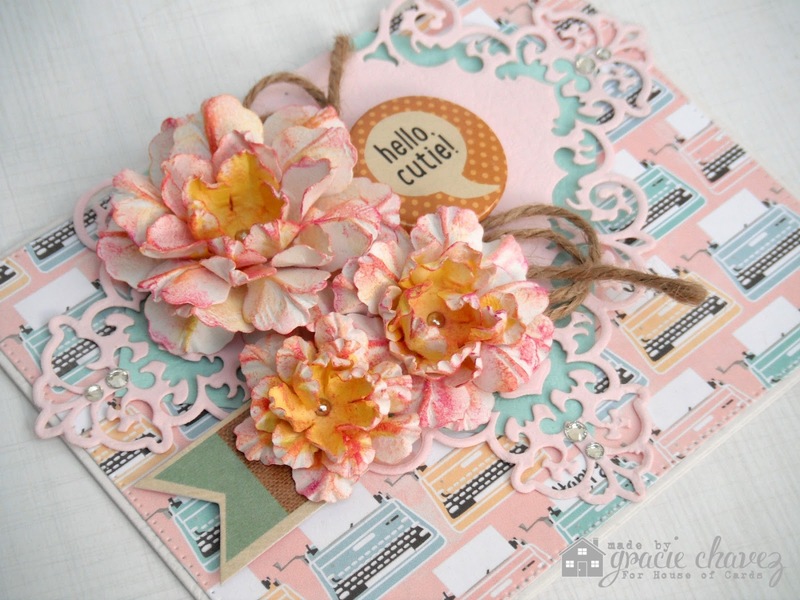 I love the image for the challenge but I decided to go with the color inspiration this time adding all the different hues to my handmade flowers and also using a fun patterned paper! I’ve been into fun elements like beads and badge buttons instead of stamped sentiments, especially for my HOC cards. This month’s theme and fresh and warm colors sure allows to experiment with textures, elements and designs so I hope you feel inspired to join us! 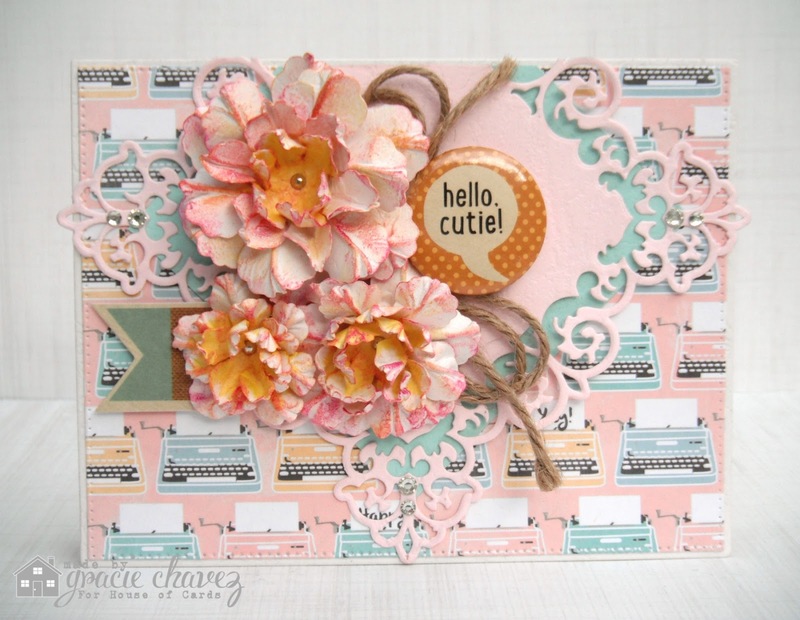 I invite you to hop along and see all the cards that the designers created this month! For more details and to join the challenge please click HERE. I hope you enjoyed today’s card and video tutorial. NOTE: Next week’s tutorial is the last in this series, and I will have some GREAT giveaways for you! So mark your calendars and subscribe to my channel so you don’t miss out! I’m so glad you stopped by today dear friends! I’ll be back soon with more content for you! Fabulous creation always, love your handmade flowers with beautiful backing papers and layering! Thanks for sharing th e tutorial, love to watch!!! Wow, Gracie, this card is amazing! LOVE those colors and all your pretty details! Just beautiful! Beautiful card Gracie! I love your flower tutorials – I've learned a lot from them! Have a great day! Wow stunning flowers here on this lovely cards. Gracie, this is spectacular. Your handmade flowers are stunning and the colors are indeed sweet summertime! :o) I love how your card is a combination of elegant and whimsy, which is one of my favorite things. Beautifully done as always, my friend. I look forward to watching your video tonight when I'm free of interruption! :o) Have a lovely evening. Girl, this is fabulous! I cannot believe you made those flowers! Seriously?! Beautiful! Gracie, this is absolutely STUNNING! Thanks for your welcome. I look forward to getting to know and working with you. Oh my, Gracie, these flowers are truly stunning!! — I'm very impressed by the gorgeous card you made!! – You're so talented! Thanks for the super tutorial, you share with us!! Wow those flowers are awesome! Beautiful work! Super gorgeous flowers. Thanks for the lovely tutorial. Love your card, design and handmade flowers. I'm learning a lot from your tutorials. Thanks for sharing! The card is simply fabulous, thank you so much for the tutorial, it's very inspiring. This card is A-MA-ZING! I loved the look of it from the thumbnail I saw on Simon Says, but when I got a closer look, I was even more impressed! Being an English major and a total lit nerd, I adored the typewriter background! And I thought it was so clever of you to mix elegant florals with a piece of retro technology like typewriters. Brilliant! And the color palette could not have been more perfect. I also loved the straight lines of the typewriters against all those fabulous swirls and curls and lacey edges. This is truly a stunning piece and I'm so glad you shared it with us here at the Simon Says Stamp Monday Challenge Blog! Love the lush flowers and your tutorial. You make it look easy but I know it needs a load of patience just to make one…LOL. I made one similar to this before and it can eat up a lot of time…Nevertheless, they are truly pretty! We appreciate you joining our Challenge at Word Art Wednesday and hope you join us again this week for a brand new challenge. Leaving you the hope only God's Word can provide in Joshua 1:9 and it says, “Have I not commanded you? Be strong and courageous. Do not be afraid; do not be discouraged, for the Lord your God will be with you wherever you go.” Have an awesome week! Stunning and gorgeous card. Thank you for sharing with us at Sparkles Monthly Challenge. So sweet! I love this color combination. Thanks so much for joining us for the Frilly and Funkie Challenge! Wow, this is a wonderful creation! Choice of colours is beautiful! I love flowers and design!